What is the difference between a portable air conditioner and window/wall units? What are the advantages of using a portable air conditioner? Can a portable A/C clean your air? How to choose an air conditioner? If you have a question about dehumidifiers that is not covered here, please e-mail us at and we will do our best to answer it. What is the difference between a portable air conditioner and the regular ones? Unlike common through-the-wall, window or central air conditioners, a portable air conditioner fits right where you need it - and you can move it to a different spot whenever you like. No installation or ducting is required (although DeLonghi portable air conditioners do use a hose to exhaust water vapors from a built-in dehumidifier). You can use portable A/C's virtually anywhere - bedrooms, family rooms, computer rooms, office, wine cellar, garage, attic, etc. 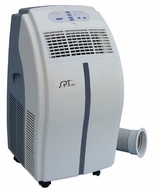 Because a portable air conditioner can be operated independently of central systems, it is easier to target cooling specifically where you want it. Cooling with a central air system usually creates wide fluctuations in temperature and causes a cool / warm effect as the thermostat cycles "on" and "off". Also, portable air conditioners use less energy than other air conditioner types. All DeLonghi portable A/C's include a HEPA-grade air filter. They also feature a built-in dehumidifier that can be run together with or independent of air conditioning. BTU stands for the British Thermal Unit, defined as the amount of heat necessary to raise the temperature of one pound of water, one degree. The BTU rating on an air conditioner shows its cooling power - the higher its BTU, the easier and faster it is able to cool a room. The typical heat gain added to a room by a person at rest is about 230 BTUs per hour. So, a 10,000 BTU air conditioner is capable of removing 10,000 BTUs of heat per hour. Choosing the correct BTU rating for your air conditioner is very important. If it is too low, the A/C will not be able to properly cool the room. If it is too high, the air conditioner can freeze over, and it would take some time for it to thaw off in order to continue working. If you have a bedroom that is 10' by 20' with windows that face the sun on the top floor of a house, regularly used by only one person, you would use the following formula. You have a wiggle room of about 15% above or below this result. If your room requires 8000 BTUs, an A/C with 6800 or 9200 BTUs will cool it adequately.